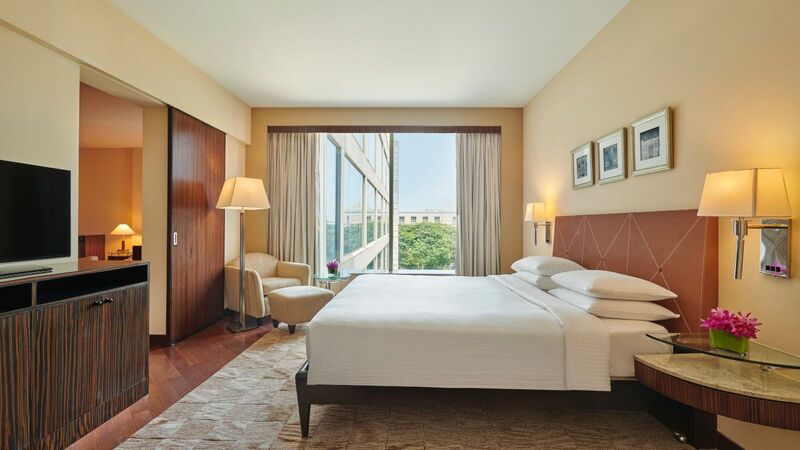 Book luxurious rooms & suites at the Hyatt Regency Mumbai and enjoy energizing experiences in the heart of Mumbai. 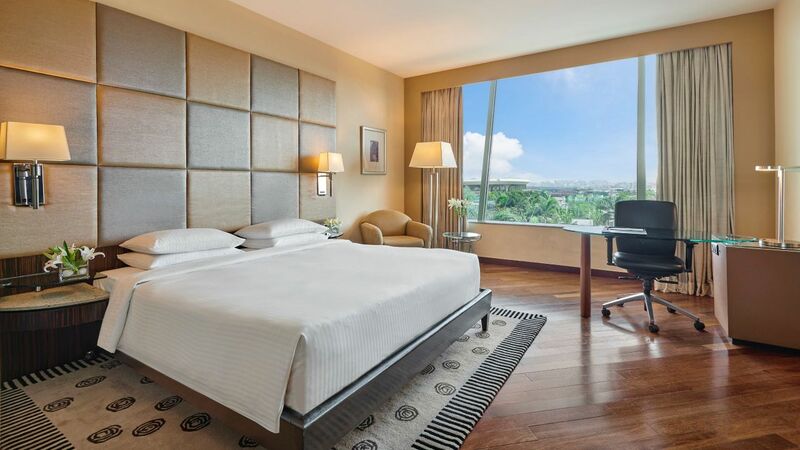 Located close to Mumbai’s airports, each of our 401 guestrooms and suites featuring contemporary interiors and amenities that ensure comfort and productivity. With spacious rooms, complimentary Wi-Fi, premium linens with all other sumptuous details, each space offers guests a place to relax and work in style. 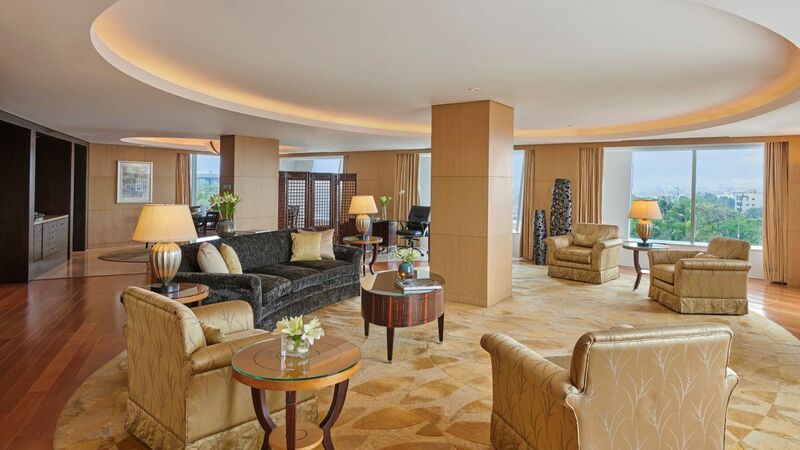 Located on the sixth floor, the Presidential Suite covers 251-square-metre of plush, tastefully decorated interiors designed for supreme comfort. The living room comes with a 55-inch plasma, a DVD player and Bose speakers. The suite also offers a luxury massage chair, modern kitchenette and a personal wine bar. 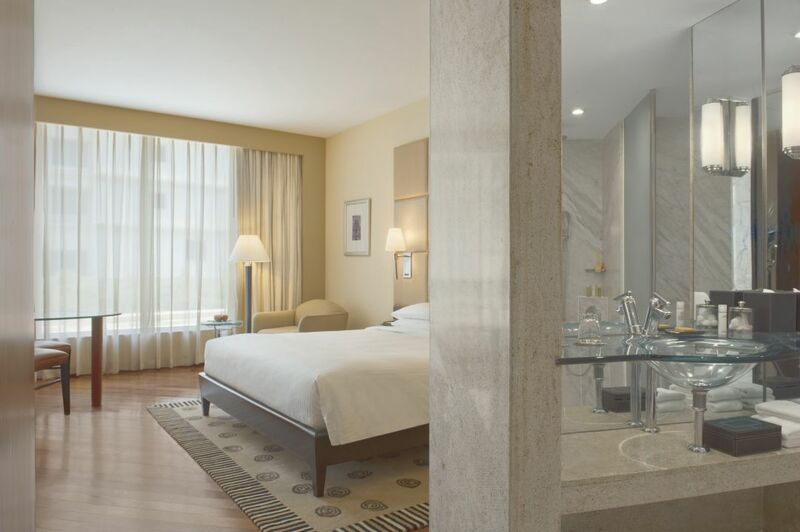 The Presidential Suite offers special touches that include luxuries such as a marble bath and a Jacuzzi to pamper your senses. This is a premium suite. See World of Hyatt program terms for upgrade eligibility. Luxurious 2 bedroom 106.3 square-metre suite with a lush living area, work desk with high-speed internet access, marble bath with a sunken tub, step-down rain shower and a plush king bed in both rooms. Enjoy a contemporary modern design with Malaysian teak floors, along with exclusive Regency Club amenities such as boardroom usage, airport transfers and access to our private lounge with continental breakfast, tea and evening cocktail hour. This is a premium suite. See World of Hyatt program terms for upgrade eligibility. Luxurious 102-square-metre suite with a lush living area, work desk with high-speed Internet access, marble bath with a sunken tub and step-down rain shower and bedroom with a plush king bed. Enjoy contemporary modern design with Malaysian teak floors, along with exclusive Regency Club amenities such as boardroom usage, airport transfers and private lounge with continental breakfast, tea and evening cocktail hour. This is a premium suite. See World of Hyatt program terms for upgrade eligibility. 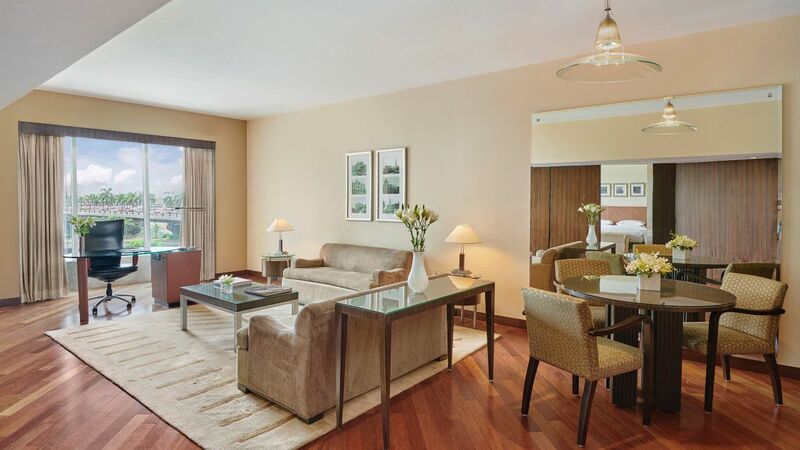 Spacious 67-square-metre suite features modern decor with floor-to-ceiling windows and Malaysian teak floors, a complementing king bedroom, living area, work desk with high-speed Internet access and marble bath with sunken tub and step-down shower. Enjoy exclusive Regency Club amenities including boardroom usage, airport transfers and private lounge offering breakfast, tea, cocktails and snacks. This is a standard suite. See World of Hyatt program terms for upgrade eligibility. VIP accommodations and exclusive amenities are yours including personalised check-in and checkout, boardroom usage, one-way airport transfer and Regency Club lounge offering Continental breakfast, tea and evening cocktails and snacks. Enjoy a 40-square-metre room with modern design that complements a plush king bed, work desk with complimentary high-speed Internet and marble bath with sunken tub and rain shower. VIP accommodations and exclusive amenities are yours including personalised check-in and checkout, boardroom usage, one-way airport transfer and Regency Club lounge offering Continental breakfast, tea and evening cocktails and snacks. Enjoy a 40-square-metre room with modern design that complements two plush twin beds, work desk with complimentary high-speed Internet and marble bath with sunken tub and rain shower. Explore sheer opulence with our VIP accommodations and exclusive amenities including personalized check-in and checkout, boardroom usage, one-way airport transfer and Regency Club lounge offerings of continental breakfast, tea, evening cocktails and snacks. Enjoy a 36-square-metre room with modern design that complements a plush king bed, work station with complimentary high-speed Internet and marble bath area with a sunken tub and rain shower. VIP accommodations and exclusive amenities are yours including personalised check-in and checkout, boardroom usage, one-way airport transfer and Regency Club lounge offering Continental breakfast, tea and evening cocktails and snacks. Enjoy a 36-square-metre room with modern design that complements two plush twin beds, work desk with complimentary high-speed Internet and marble bath with sunken tub and rain shower. Enjoy premier views of our glistening swimming pool and manicured lawns from a stylish 36-square-metre modern day designed room offering a plush king sized bed, Malaysian teak floors, oversized mirrors, floor-to-ceiling windows, high-speed internet access, marble bath with a separate tub and step-down rain shower along other complimentary in-room amenities like complimentary newspaper and bathrobes. 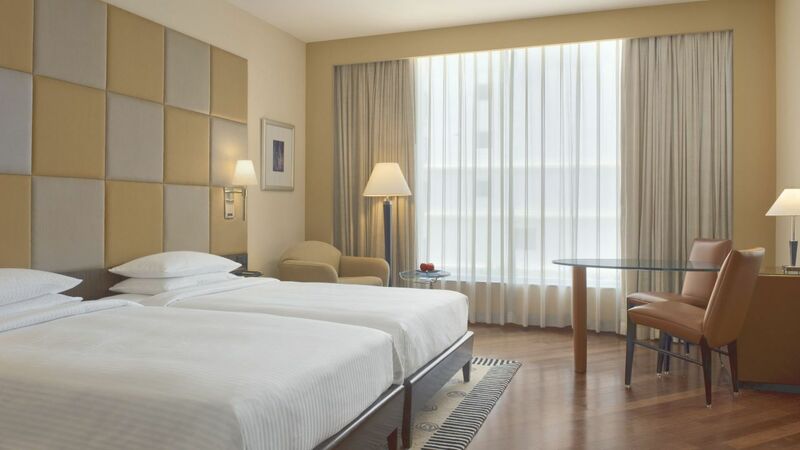 Hyatt Regency Mumbai welcomes you with the best accommodation in Mumbai. Our King Room is well equipped with contemporary facilities for the business as well as leisure travelers. 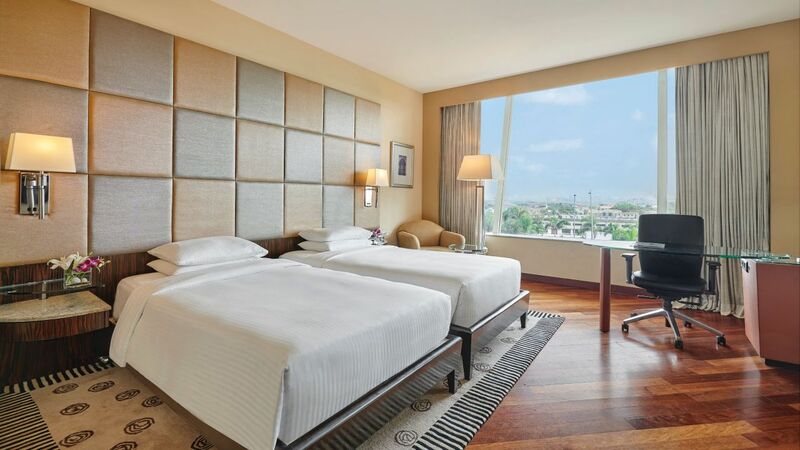 Exquisitely built our 36-square-metre room features modern day design with Malaysian teak floors, oversized mirrors and floor-to-ceiling windows. Enjoy a plush king sized bed, a work desk with high-speed Internet access, marble bath with a separate tub and step-down rain shower and other complimentary in-room amenities like complimentary newspaper and bathrobes. 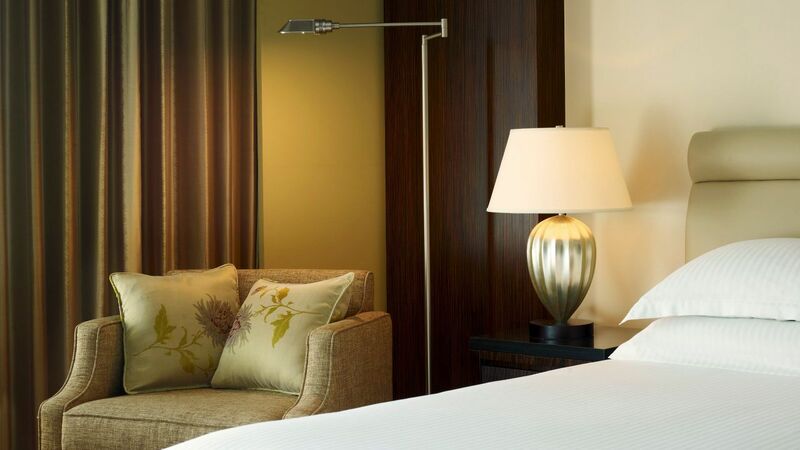 Hyatt Regency Mumbai welcomes you with the best accommodation in Mumbai. Our Twin Room is well equipped with contemporary facilities for the business as well as leisure travelers. 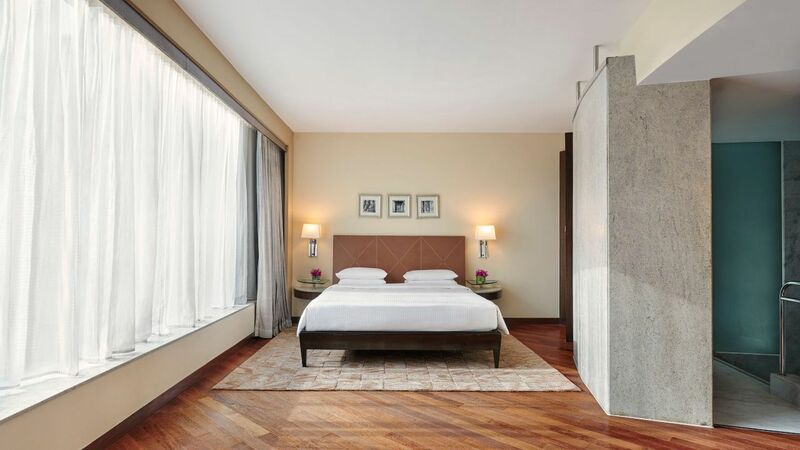 Exquisitely built our 36-square-metre room features modern day design with Malaysian teak floors, oversized mirrors and floor-to-ceiling windows. Enjoy comfortable twin beds, a work desk with high-speed Internet access, marble bath with a separate tub and step-down rain shower and other complimentary in-room amenities like complimentary newspaper and bathrobes.